The only survivor of the first family infected by Medusa. After the death of her family, Alice set fire to her home so that "he" couldn't escape. "He" turned out to be a construct of her mind, made real by the Medusa and stabilized into a permanent physical form by eating the head of Alice's late brother's reindeer. She called him 'Laloo'. He emerged from her back, leaving a massive scar. 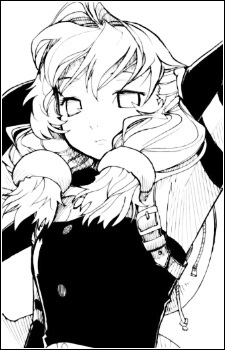 In the manga, Alice is first seen as an attractive young woman with blonde hair who is following the group, apparently with sinister intentions, but turns out to be more of an observer as she is not the real creator of the majority of monsters. Furthermore, Alice's "body" is merely a projection of her mind—Alice forcibly leads Kasumi to her real body, revealing herself to be little more than a torso, a left arm, and a head, kept alive by machinery. She had a guardian that resembles an antromorphic, large white rabbit. Later, she gave up her life to resucitate Marco, who suffered fatal wounds after he was forced to fight the "Zeus Pantheon"